You must spend $10.00 or more, and the purchase must include at least one Neosporin Ointment or Cream product and one Band-Aid bandages product. Purchases must be made between 4/7 and 4/30. Requests must be received by 5/31. Mail in the completed rebate form, the original store receipt with products circled, and the UPC barcodes cut from the package. Limit one offer per household mailing address. Allow 6-8 weeks to receive a $5.00 rebate check and first aid bag. This week at Walgreens, a purchase of two select Band-Aid packages or Neosporin products will generate 3,000 Balance Rewards Points. It’s that time of year again…Time to plan the garden! , the April Ace rebates have you covered. Your purchases must be made between March 31, 2013 and April 30, 2013, to qualify. Members of Ace Rewards can submit their rebate claims online and save on postage. If you're new to mail-in-rebates, be sure to read Tips for Getting Rebates. Johnson & Johnson. 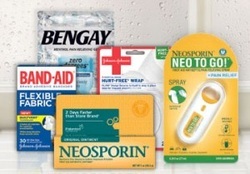 Buy $10 worth of select Johnson & Johnson First Aid products and get a $5 check by mail, a First Aid Bag, and $17 worth of coupons. Offer ends 4/21/13. CalleX Ointment. Get $4 back by mail wyb CalleX Foot Care Ointment before 4/30/13. Nony-X Nail Gel. Get $5 back by mail wyb Nony-X Nail Gel. Offer ends 4/30/13. 3M Auto Products. Buy three rolls of 3M Automotive Window Films and get one free after mail-in rebate. Offer ends 4/30/13. Nintendo. Get a FREE digital game wyb and register the Nintendo 3DS XL system and a qualifying game by 4/30/13. Elmer's. Get $3 back by mail wyb one Elmer’s 3D Glitter Glue product and two Elmer’s Foam Board Sheets before 4/30/13. Howe's. Get $10 back by mail wyb two Howes Meaner Power Kleaner (qts.) before 9/30/13. Tub O' Towels. Get $2 back by mail wyb Tub O' Towels (90 ct.) at a participating retailer between 4/1/13 and 4/30/13. Feline Pine. Try Feline Pine Clumping Cat Litter for FREE after mail-in rebate ( up to $14.99). Offer ends 6/30/13. Quickie. Get a $5 mail-in rebate wyb a Quickie HomePro Minute Mop before 6/30/13. SkinZinc. Get $4 back by mail when you purchase SkinZinc Dual Action Psoriasis Formula from Walmart before 6/30/13. Actifade. Get $5 back by mail wyb Actifade Precision Age Defying Complex from CVS/pharmacy, Walgreens or Walmart or Actifade :face at Walgreens before 6/30/13. Kissaluvs. Get $10 back by mail wyb $100 worth of Kissaluvs Diapering products before 7/2/13. 3M Auto Care. Get $10 back by mail wyb a select 3M Fuel System Tune-Up Kit before 7/31/13. Welch's. Get a FREE Nalgene Water Bottle (12 oz.) wyb any three Welch’s Refrigerated Juice Cocktails (59 oz/) before 7/31/13. Zyrtec. Get $7 or more in savings when you enter codes from bottles of Zyrtec. Program ends 12/31/13. Prevacid 24HR. Program extended: Sign up for the Prevacid24HR Perks Program and you can earn rewards ranging from FREE salon treatments to magazine subscriptions each time you buy Prevacid 24HR. You can claim one reward each month through 12/31/13. Get up to $12.99 back by mail wyb Hill’s Ideal Balance dry dog food before 12/31/13. Get up to $12.99 back by mail wyb Hill’s Ideal Balance dry cat food before 12/31/13.